This is the second restaurant I’m writing about that’s linked to the Paradise Group (the first being Paradise Dynasty), and I’m starting to feel like I should be paid for writing this (which I’m not, but hey Paradise, payment in kind (i.e. 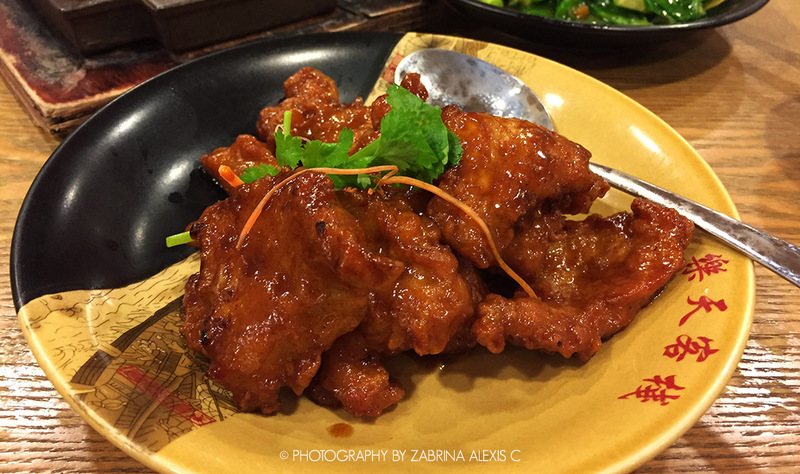 food) is just fine) 😛 Paradise Inn is another of my go-to restaurants, simply because it’s so unpretentious – just good Chinese food in a comfortable teahouse setting – and on some days, that’s really all you want. The Paradise Group Restaurants are everywhere and the standards are very high across its different chains. If you’re in any major mall, chances are there’s a Paradise Inn nearby. Paradise Inn is pretty pocket-friendly – I’ve been there dozens of times and I’d say on average it’s about $20+ per person. We typically order about a dish per head (i.e. 5 dishes for 5 people) or slightly more, and it’s always been about right. When my family wants Chinese food, this is a default option. It’s fuss-free, comfortable but not sloppy, and service has always been pretty good (except when they’re running at full-house – but even then they’re still relatively quick to respond). From our experience, the wait staff are always very courteous and willing to help, and with Chinese tea that’s always flowing, we always come away with full and satisfied stomachs with none of that greasy-oily feeling like from some other places. Since I’ve been to Paradise Inn so many times and have tried so many dishes on the menu, I can safely say most of the food is very good- but to help those who’ve not been or friends just visiting Singapore for travel, here are some dishes that I would strongly recommend. This dish is a must-order, and we never leave Paradise Inn without it. Although it reads “Pork ribs”, it’s really just pork fillets- which makes it even easier to eat and value for money since there’s no need to pick tiny morsels of meat off the bone like the one at Whampoa Keng Fish Head Steamboat Restaurant. The sauce is a special savory sauce that has a slight sweetness to it, and encrusts the outside of the pork to give it a good caramelized and slightly crisp bite. I’ve tried the Coffee Pork Ribs too – it’s a bit similar in terms of the way it’s cooked, but is sometimes a bit overdone resulting in a slightly burnt flavour, so it really depends. If you ask me, I’d say go Imperial. I’d eat every last scrap of this. If you like tofu, minced pork, egg, and lots of sauce, this is going to be your baby. 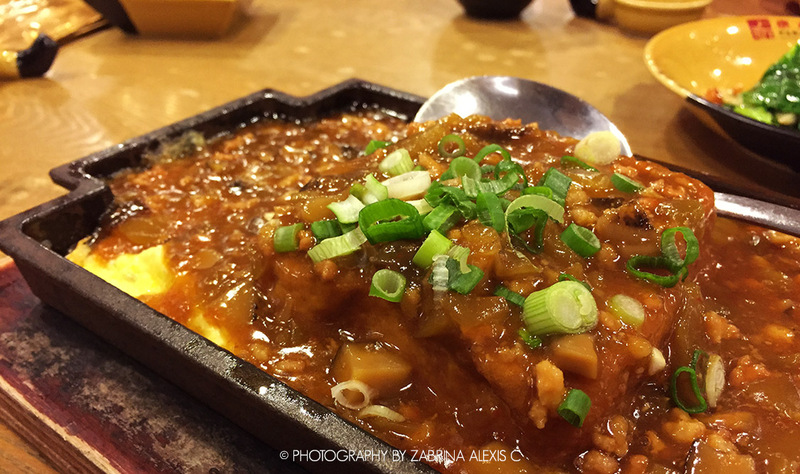 The tofu is smooth and soft, and comes surrounded by a moat of bubbling egg, topped with a delicious and intensely-flavored sauce containing generous portions of minced pork and mushrooms. The leftover sauce goes perfect with everything, and the this dish tastes especially great when piping hot. Known in the local dialect as “Kong Bak Pau“, this dish is not commonly served at most restaurants. It is also a dish that’s hard to get right – I’ve had some poorly done pork belly which is either too lean or too fatty or even too tough. Not only must the composition of the pork be right, the stewing process needs to be done correctly to infuse the pork with the rich dark soy sauce-based marinate. A good kong bak would have a fat layer that melts in the mouth easily alongside tender, lean, and juicy meat. Paradise Inn has a great one, and is a great place to get your kong bak pau fix without having to make a special effort.